When you think of the Great American Songbook, some of the finest in in the literature of music comes to mind. This is far from a static library of songs that are borrowed by musicians every now and then to put their own spin on things. It is a moveable feast and to this splendid musical repast often comes something new and enduring. The music of Thelonious Monk and Wayne Shorter comes immediately to mind, as does that of Duke Ellington and Charles Mingus…the Beatles, to name a few. Does it new this end there? You would be hard-pressed to think of another voice, right? 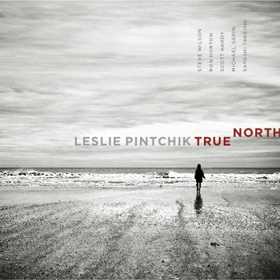 Perhaps… But then you might not have heard this latest disc by the pianist Leslie Pintchik entitled True North. The six original songs on this gorgeous album of ten are so remarkably written that I would wager that they have an extraordinary chance of entering into those hallowed portals created by Hal Leonard and Irving Mills. Just what is a ‘Standard’? It is hard to define. Many publishers who dominated the industry in early part fo the 20th Century seem to have created a so-called ‘Songbook’ – which has actually existed as a published book – more as an attempt to market and make not a little money off music that was written for Broadway and Hollywood productions. Musical forms were somewhat fluid, but mostly dominated by songs deeply influenced by the pop music of the day, namely jazz and classical music. However it is not just commerce that made the Songbook. The inventive, no-holds-barred characterisation of a song with or without words often meant that it had the enduring quality that created a demand for the music to be repeatedly performed by musicians fell in love with this music and re-used it often to define their own musical personalities. The music Johann Sebastian Bach in the classical realm and the Jazz music of Ellington, Mingus, Monk and Shorter are unforgettable examples of this fact. 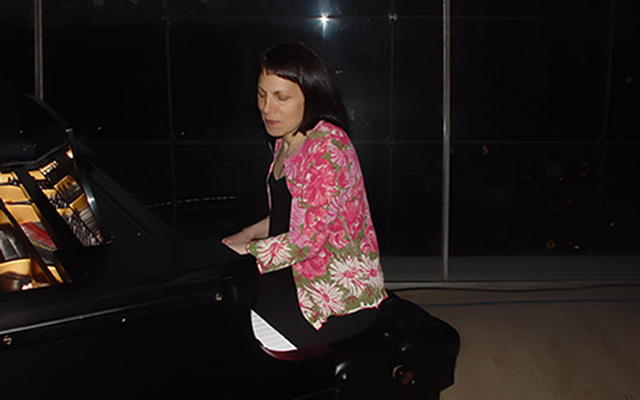 The combination of popular appeal and profundity of thought begs special recognition for the ‘literary’ (for want of a musical term) the music that Leslie Pintchik writes. But her work goes even further in originality and exploratory boldness, summing up a lifetime’s experience in music that ranges from the village green, via the sophisticated salon, to Wordsworthian voyages ‘through strange seas of thought , alone. Just as you can’t imagine the 20th Century without Thelonious Monk’s oeuvre, or the 21st Century without Wayne Shorter’s I am putting all my money on the future of Leslie Pintchik’s oeuvre and the proof of this is in this disc. Few 21st opuses on are so diverse or so heedless of the acknowledged conventions of the time. And if it seems odd to talk of Pintchik in the same breath as Shorter and Monk, listen to the indispensible recording of the endlessly surprising works. Granted that they are performed here by a pianist, a saxophonist and a trumpeter, together with a bass and percussion section, but if you pay close attention you will surely hear how highly strung violins, sinewy cellos and rumbling basses and a host of horns give ‘extreme’ performances of this repertoire, just a beautifully as a solo piano, or even a solo horn can do. And what of these performers led by Leslie Pintchik herself? Very few quintets in my experience have employed such a wide range of colour and dynamics this music, often with revelatory results; the blanched, disembodied ‘em>pianissimo in the visionary modulations in the visionary modulations in the finale of ‘Tumbleweed’; or the sudden veiling of tone to illuminate a magical shift of key in ‘True North’ is played with controlled bucolic delirium. Finally there is the extraordinary manner in which Pintchik’s music fits in with that of Henry Mancini’s, J. Fred Coots, Frederick Hollander’s and John Lennon’s. And that’s just a fact and further proof of the deeply pondered nature of this music that takes nothing for granted. Track List: Let’s Get Lucky; Tumbleweed; Just Sayin’; Imagine; Crooked as a Dog’s Hind Leg; True North; Falling in Love Again; Charade; Discreet; For All We Know. Personnel: Leslie Pintchik: piano; Steve Wilson: alto & soprano saxophone (1, 2, 5, 6, & 9); Ron Horton: trumpet & Flugelhorn (1, 2, 5, 6, & 9); Scott Hardy: bass; Michael Sarin: drums; Satoshi Takeishi: percussion (1 – 9).